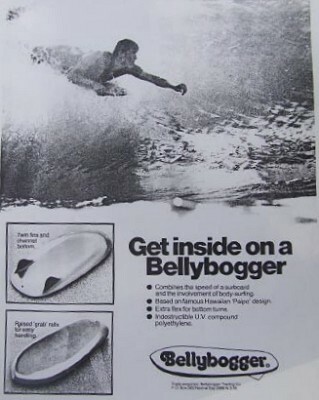 MANUFACTURER: Belly Bogger Pty. Ltd.
Deck: concave/spooned with moulded leg rope hole. Bottom: Rounded hull leading to flat with twin chinned rail channels. Robert Bell collection, Photographs February 2001. The board is in poor condition and the shell has badlly deformed. Thorough analysis of rail and bottom features is speculative, the fins now tip in due to bottom deformation. 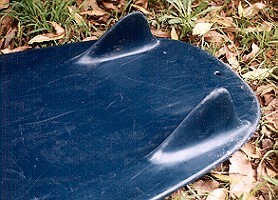 Plastic moulded version of the juvenile paipo/bellyboard. Featured Roger Casey (K.C. Surfboards) riding stand-up. Other Boards: See Paipo Catalogue for other prone craft.